Habitat: The best substrate Cork or Rock surface and then a lot of that on the back wall for these animals to climb on. Fan Foots also like small flat rocks And like all geckos a place to hide. They need a water dish and also they need to besprayed daily. Food: they eat waxwormsand smalllocus in the spring and in the summer small spiders,grasshoppers, etc. also some green vegetables. 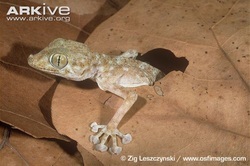 EXTRA INFO: The Fan Footed Geckos live in North Africa. Their scientific name is Ptyodactylus hassliquisti. These animals grow to 5"-7" long. Fan Footed Geckos have long fanned toeswhich tags along with its name. They have fan like toepads. Fan Foots are a golden brown, gray,tan or pinkish color.